Salutations to my most esteemed Storytellers. Greetings to my most gracious Game Masters and delightful Dungeon Masters. What would you say if I told you that in our beloved hobby there is an actual sport that tested us to our very limits and put all of our many talents on full display? No, what I refer to is something visceral. Something brutal. Something sure to test the mettle of even the most veteran of GMs out there. It is unlike anything you have ever seen before, and it can be summed up in three words. And what is this blissful gift to our hobby called? 50 MORE Adventure Hooks To Swipe For Your Game! John Popper of Blues Traveler once sang, "The hook brings you back. On that, you can rely". Was he wrong? Here we are again with a sequel to the extremely popular "50 Adventure Hooks To Swipe For Your Game". Hooks are usually there to entice players into following along with a story. These are a bit different. These hooks are for the Game Master and are designed to flick that little switch in your brain that lets your imagination run wild off a simple idea. We shall see some scintillating, scandalous, sickeningly simple story seeds so sufficiently straight-forward, some should see themselves seriously sold on the subsequent scenarios, surely. 1. Just outside of town is a Wizard's Tower. Strange, it wasn't there last night. 2. A wave of burglaries sweeps through town around the same time as a band of strange-looking street performs make their presence known. Well hello, boils and ghouls. It is I, your ghostly host with the most; Dread The Bard. 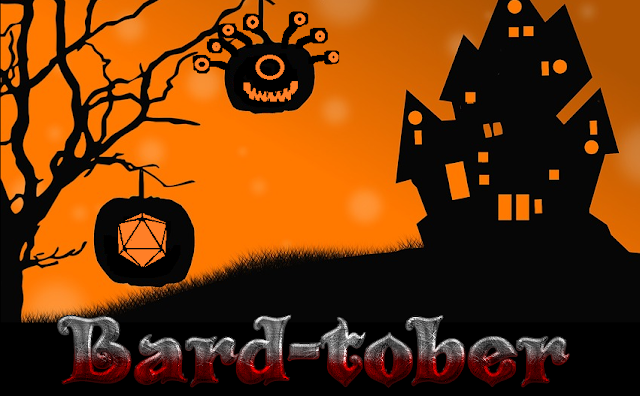 'Tis Mid-October, a time for changing leaves, carving pumpkins, and terrifying your players with a grisly one-shot in the theme of All Hallows Eve. Why a one-shot? Because, as much as we would all like to run Curse of Strahd, most of us only have time for a couple of game sessions before we are forced to abandon the candy corn and bad Halloween puns and subject ourselves with being bludgeoned over the head with Christmas decorations. The iron-bound door shatters as the paladin, resplendent in his gleaming plate armor, forces his way into the massive stone room. His companions soon fan out behind him as they stare down the dreadful necromancer Mort Nomicon. Mort: Aha, we meet again, at last! Paladin: Your reign of terror ends now, necromancer! We are here to foil your plan! Mort: Curses! How did you fools find my hidden lair?! Paladin: Hidden? You are in a black tower in the middle of an open field. The tower is adorned with skulls. How could we miss it? You all but hung a sign out front that said "Evil: Inquire Within"
Something is happening to me in a few months that hasn't happened to me in ages, and I approach it with all the appropriate excitement of a bard of my stature. You see, after I wrap my current campaign, I am going to have an opportunity to do something I don't often get to do; actually play. We are talking schoolgirl levels of giddiness, here. I am often the story teller, the man behind the screen. The times when I actually get to get down and dirty along side the other players are few and far between. To be playing in what looks to be a long-running has had me chomping at the bit. I've already cooked up my character concept and went to work writing the backstory.